A new air conditioning system is a big investment. Whether you are upgrading an aging or broken A/C – or adding air conditioning where there was none before, it is important that you choose a company you trust to ensure your investment is protected. T.Webber has been a cornerstone of the Hudson Valley home service market for 30 years. We pride ourselves on our craftsmanship, attention to detail, and dedication to excellent customer service. To us, the craft of installing a system is as important as the quality of the system itself. When you trust T.Webber with your installation, you can ensure your new system will be installed with precision and care. Reputation – A+ Rated by the BBB, over 30 years in business and tens of thousands of satisfied customers. We are dedicated to providing excellent customer service to our clients. Custom Solutions – Each system is crafted based on your home’s individual layout and your family’s needs. No cookie cutter swap outs, just custom designed solutions. Technical Excellence – From system design to installation, we pay attention to the details. Our staff is comprised of skilled tradesmen who take pleasure and pride in their work and are committed to excellence in all facets of the trade. All installs are done to technical code or better with top of the line materials and equipment and come with a One Year Worry Free Guarantee for your peace of mind. Turnkey Services – At T.Webber, we have our own in-house Master Plumber and Master Electrician so all phases of your install will be completed by our staff. Most other contractors sub out certain elements of your install. 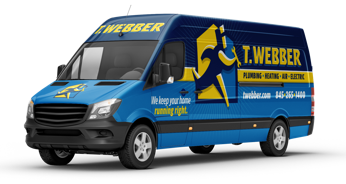 With T.Webber, you put your trust in us – and only us. Cleanliness Guarantee – We respect your home as if it were our own, using drop clothes and shoe covers and taking care to leave your home cleaner than when we arrived. You won’t even know we’ve been there! When installing a new A/C System – design matters. Some would say even more than the equipment itself. Did you know that about 50% of the money you spend on cooling your home is being wasted because of improper installations? Some of the most common issues with installations include – incorrectly sized units, incorrect air flow, leaky duct work, improper wiring, and not meeting mandated code requirements. When a unit is installed improperly, it does not matter how great or high-efficient the equipment is, it simply will not work as designed. Improperly installed systems lessen efficiency and increase the potential for safety hazards. They result in higher energy bills, higher maintenance costs, reduced equipment lifespan, and less comfort for the homeowner. In short – INSTALLATION TECHNIQUES MATTER. That is why it is important to carefully choose your installer, and recognize not all systems are equal. T.Webber offers complimentary on-site estimates for new and replacement air conditioning systems. Our Comfort Consultants take the time to properly measure and complete heat-load calculations so that your new system will be correctly sized for your home. We’ll want to know about you and your lifestyle – and what is important to you before quoting a system. We’ll then design a custom plan to meet your needs. Thinking of upgrading your existing HVAC or installing a new system in your home? Call us today to schedule a free on-site consultation.